I want to give you a free six-page digest of great music marketing tips and news from the past week. You can download and print the PDF right now using this link. No opt-in required. Just download these free promotion tips and start using them. What's included in these six pages? Why am I giving you this? There is a good reason, and I really want your direct input about it. As you may know, I spend a lot of time scouring the Internet every day looking for the latest news, info and best practices on music marketing for independent artists. A lot of those links I post on Twitter, Facebook, and other social sites. But even if you follow me on these sites, I bet you miss a lot of them. Plus, who's got the time (like I do) to obsess about these things and sift through the avalanche of new marketing blog posts, articles, podcasts, videos and more that are posted every day? After all, you need to spend time writing songs, rehearsing, recording, booking your next gig, and making sure your equipment is maintained. Not to mention eating, sleeping and ... Whew! The list goes on and on. What if I created a regular digest of the best new music promotion ideas, breaking news, success stories, highly useful marketing tips, and more? It would basically be my top picks for the best of the best every week -- probably delivered four times a month as a PDF file like this one. I'd also throw in some of my more in-depth articles along with some from my favorite authors and marketing bloggers. My question to you is ... Would a Music Marketing Digest like this be of interest to you? And would you be willing to pay a modest fee for it? It takes a lot of time (many hours a week, believe me) to research this stuff and then package it in this format. So enough people would have to step up to the plate and be willing to invest a small amount to make this happen. If you are interested, send an email to MrBuzzFactor A-T Gmail DOT C*O*M (please rearrange those gobbled-up letters into a proper email address) with the words "Music Marketing Digest YES" in the subject line. I'll put you on a special list of music people who want the Digest, and if the demand is sufficient, you'll be the first to know when I launch it. 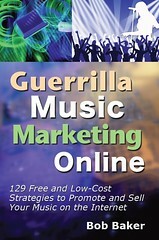 Thanks for reading this free sample of my proposed Music Marketing Digest and hearing me out. P.S. I hope this works out for both of us, because I would love to create this for you on a regular basis. But I have to know that enough people want it and see the value. So let me know if you are one of them! I just read the PDF a bit and is awsome. I will need to review it in more detail because is a lot of info. Please keep it coming! Hey! Brazil is following your tips since 2005! Thanks for sharing! Some great links and very positive ideas in here - well worth a serious look. I think 4 times a month is too much information to take in amongst all my other stuff that is happening. Maybe once a month I could use it. Bob, very very interesting info. The holiday marketing info is a great suggestion for the readers. I have tried this, but it has not worked. The info in the PDF is great. Reading-wise I feel single column is easier to read. I wonder what other readers think. Other than that, the PDF is very useful. The information as a whole was terrific! I know this sounds a bit silly but with all of the other "only $10 a month" I really have to evaluate which newsletters give me the most USEFUL information in this digital age for a working musician. I also agree with the comment that 4xs a month may be a bit much, tho once a month isnt often enough. I think twice a month is a great way to go, gives us time to digest and try your advise before the next newsletter. Ive been a follower of yours for as long as i can remember so keep up the good work, a bunch of us really rely on your words of wisdom!